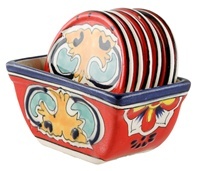 Beauitful Handcrafted Napkin Holder will be a great addition to any table setting. Colorful and fun hot plate. Will add remarkable character to any counter top. Beautiful Handcrafted Salt and Pepper Set will add unique elegance to any table. This coloful spoon rest will add unique character to any stovetop. Lead free and dishwasher safe. Wonderful addition with the creamer and salt & pepper set. 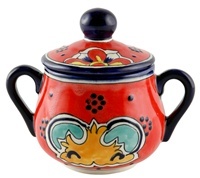 Beautiful handcrafted creamer will make a wonderful addition with the sugar bowl for a unique coffee/tea time. "Coffee mug 4.75"" x 4.5"""
Elegant and colorful wine goblets for any occasion. 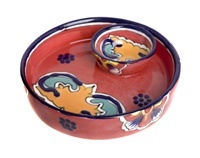 This beautiful olive dish is lead free and dishwasher safe. This elegant coffee cup is lead free and dishwasher safe. Elegant butter dish for any table setting. Great addition with the salt & pepper set. This beautiful olive dish is lead free and dishwasher safe. 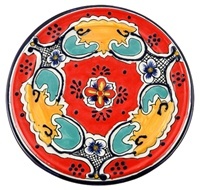 These elegant handpainted coasters look great on any table setting. "Egg crate 7"" X 9"""
This beautiful egg crate is hand crafted in Mexico. 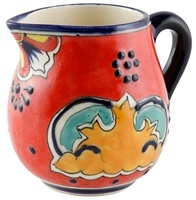 This beautiful handpainted pitcher is not only functional for table service but also makes a great decorative shelf piece. Makes a great vessel for an outstanding flower arrangement. They are lead-free and dishwasher safe. 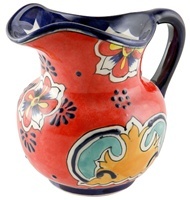 This beautiful handpainted pitcher is not only functional for table service but also makes a great decorative shelf piece. Makes a great vessel for an outstanding flower arrangement. They are lead-free and dishwasher safe.